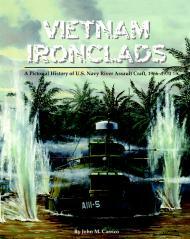 Vietnam Ironclads presents a fascinating look at the specially designed armored gunboats used during the Vietnam War. This volume combines years of meticulous research with many never-before-seen photographs taken by navy combat veterans, and from official government archives. Each type of riverine combatant is explained in its own chapter. The book begins with a historical overview providing insight into the unique challenges of America’s twentieth century riverine assault force. Discover the interior details of an Armored Troop Carrier, Monitor, and Assault Support Patrol Boat. Also explore the only surviving river assault craft of the Vietnam War, a program 5 Command and Communications Boat. This book will appeal to any naval history enthusiast, scale modeler, or military veteran.